This educational attraction’s exhibits look deep into the past and inspire future generations. President John F. Kennedy and First Lady Jacqueline Kennedy Arrive at Inaugural Ball. 20 January 1961. Rowe, Abbie, 1905-1967. Courtesy of JFK Presidential Library & Museum. “A man may die, nations may rise and fall, but an idea lives on.” Visitors will come across this quote and many more from John F. Kennedy, the United States’ 35th president, as they tour the library and museum named in his honor. Located next to the University of Massachusetts at Boston, the Massachusetts Archives and Commonwealth Museum and the Edward M. Kennedy Institute for the U.S. Senate in the city’s Dorchester neighborhood, the project was spearheaded by the Kennedy family and 39th President Jimmy Carter. Since 1979, the attraction’s exhibitions have revealed JFK’s life through library records, historical preservation and, most recently, video documentation. The journey through the popular president’s life begins at the Young Jack exhibit, a room filled with photos, projected images and written excerpts from JFK’s birth through college years. Born in 1917, Kennedy grew up in Brookline, Massachusetts with his parents and eight siblings before attending Harvard College in 1936. The exhibit mostly coins the future president as a voracious reader and writer who expands on his senior thesis, “Appeasement at Munich,” in his first book, Why England Slept. In both pieces, Kennedy investigates England’s futile strategies to prevent World War II and predicts how the world would have fared if England entered into an earlier conflict with Nazi Germany. More photos show Kennedy during his deployment in World War II, coupled with excerpts from his parents’ diaries, letters and transcribed interviews. Lt. (jg) John F. Kennedy, 1942. Photograph by Frank Turgeon Jr. Courtesy of JFK Presidential Library & Museum. Following the Young Jack exhibition, visitors are invited to watch a fascinating video narrated by JFK himself. In 20 minutes, he describes his life leading up to his Democratic nomination for president in 1960. The images captured in the video along the way are simply stunning, from the president’s lavish wedding to then Washington Times-Herald reporter and photographer Jackie Kennedy to speeches given earlier on the campaign trail. There’s no doubt that the media also played a huge role in the 1960 presidential election. Students will learn about the media’s power as they tour exhibits showing key presidential debates on television. In particular, many will stop to watch the debate that supposedly won Kennedy the presidency. During that time, those who heard the debate between Kennedy and his Republican opponent, Richard Nixon, had said that they thought both candidates performed equally well. However, television gave away Nixon’s nervousness with close-ups of the Republican nominee sweating profusely. Later on, over 150 members of the press would be invited to JFK’s inauguration. Kennedy became the first president to address the media through live televised press conferences, as the JFK Meets the Press exhibit shows. “Kennedy for President” pin. Created by Donald Wilson. Courtesy of JFK Presidential Library & Museum. The next stages of the museum show the timeline between Kennedy’s inauguration and his assassination. One of the most striking rooms is the Oval Office, which features the famous wooden presidential desk and chair, offset by other furniture and heavily draped curtains. Many will stop to watch Kennedy being sworn in on January 20, 1961 on the projected screen at the back of the office. Other clips show other key points in history from that time, including Martin Luther King, Jr.’s monumental “I Have a Dream” speech and Kennedy’s engagement with the civil rights movement. Inaugural Address of John F. Kennedy, 35th President of the United States. Washington, D.C. 20 January 1961. Army Signal Corps. Courtesy of JFK Presidential Library & Museum. After witnessing the inauguration, students will examine Kennedy’s national and foreign policies. In The Space Race, they will find the Freedom 7 capsule, which is known for being Kennedy’s longstanding initiative to make the United States “the world leader in space exploration.” They will also have the opportunity to watch a 14-minute video entitled “To the Brink.” Directly following the Freedom 7’s success in May 1961, the Kennedy administration was faced with the Cuban Missile Crisis. The video shows JFK’s October 1962 address and the fear that fellow Americans expressed over the missiles, Kennedy’s decision to enforce a naval blockade around Cuba and the possibility of war on the horizon. 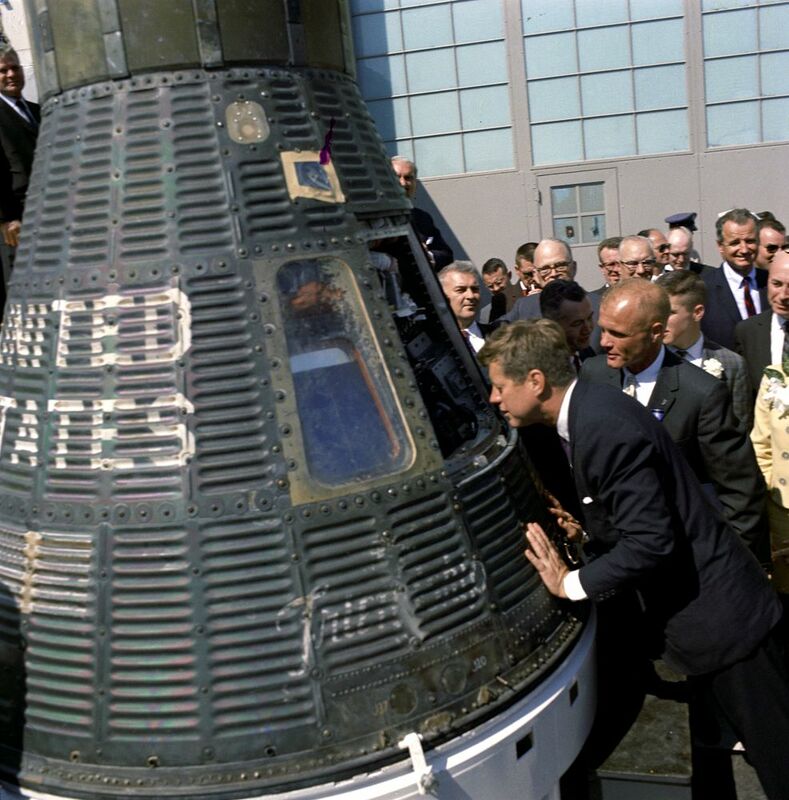 President John F. Kennedy and Astronaut John Glenn Look Inside Friendship 7 Space Capsule. 23 February 1962. Stoughton, Cecil W. (Cecil William), 1920-2008. Courtesy of JFK Presidential Library & Museum. Several museum exhibits focus on Jackie Kennedy’s life as well. The First Lady Jacqueline Bouvier Kennedy room preserves some of her most prized possessions, such as her camera from her photography days, her travel journals, a white Chanel coat and a custom red skirt suit by Christian Dior. A center gallery, one of the museum’s newest exhibitions, features the breathtaking Oleg Cassini gown that Mrs. Kennedy wore to host the 1962 State Dinner in honor of Ivory Coast President Félix Houphouët-Boigny. Mrs. Kennedy was known for organizing state events that celebrated American cultural achievements and fostered cooperation among national leaders. 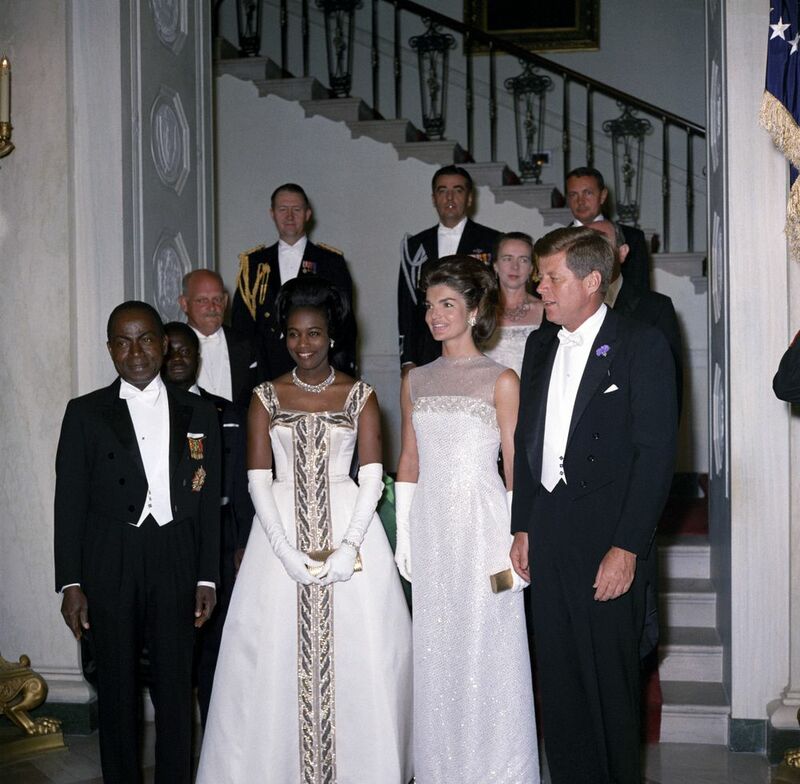 President John F. Kennedy Attends Dinner in Honor of President of the Ivory Coast, Félix Houphouët-Boigny. 22 May 1962. Knudsen, Robert L. (Robert LeRoy), 1929-1989. Courtesy of JFK Presidential Library & Museum. Towards the end of the trip, all tours walk through a darkened tunnel with several television screens reporting on JFK’s assassination. This short viewing is followed by an open space for reflection. The gallery overlooks the scenic Charles River and houses a few statues and flags commemorating Kennedy’s life. Students may also visit the museum café and gift shop, located near the entrance. For additional knowledge, planners can request to view writer Ernest Hemingway’s vast collections of about 11,000 photographs and other private documents. Visit jfklibrary.org for more information about the JFK Presidential Library and Museum. Teachers and educational travel planners who are interested in arranging group tours should call (617) 514-1589.